By Nina Frizoni on September 3, 2013 in Articles, Blog & Vlog! Sadly, the topic of massage and cancer is one that provokes fear and misunderstanding into the hearts of even the most seasoned of massage therapists. Despite decades of important work in this area, many massage therapists still subscribe to the outdated myth that massage is contra-indicated or feel unqualified to treat a client with the condition. Yet cancer is so common that it is likely that all of you keen bodyworkers out there will at some point come across this issue in your practice. Chances are you will encounter either current patients with a diagnosis, those who have been in the past, or those with family or friends undergoing treatment. It is vital as a profession that we inform ourselves about the reality and current research regarding the use of massage with cancer. Can we massage clients with a cancer diagnosis? The short answer as Bob the Builder would say – “yes we can!” With the right skills, knowledge and training, massage is PERFECTLY SAFE for clients with a diagnosis of cancer. •	It is well established by scientific research that cancer cells have to undergo many different genetic mutations in order to metastasise. •	Research now shows that regular exercise (which increases circulation) is beneficial for people with cancer. Think about it – is your massage likely to increase circulation more than a gentle walk on the beach or a relaxing bike ride? •	Also, the possibility of different massage styles and pressures being applied appropriately was not considered. The original thinking behind the contra- indication was based on the idea of Swedish massage increasing blood and lymph flow. Yet there are tons of other great massage techniques that are not based on increasing circulation – Eastern based techniques such as Amma , shiatsu or tuina, plus modalities such as trigger point therapy and myofascial release to name a few have very different theoretical underpinnings and effects on the body. In fear, however, organisations offering qualifying courses in massage and other bodywork modalities often continue to list cancer as an illness contraindicated for treatment. This fear has resulted in many people with a cancer diagnosis being turned away by therapists, therefore being denied the possibility of a valuable contribution to their healing. Fortunately, following research and education, this unfounded myth and resulting fear have been challenged by therapists who have learnt to adapt treatments to be safe and appropriate, work alongside other health care providers, conduct research trials to assess the benefits of massage and most importantly to make a person undergoing often distressing, invasive procedures during their cancer treatment feel whole again. One of the basic tenets of professionalism in massage is that we never “claim to cure” and this is especially important with a condition as serious as a cancer diagnosis. 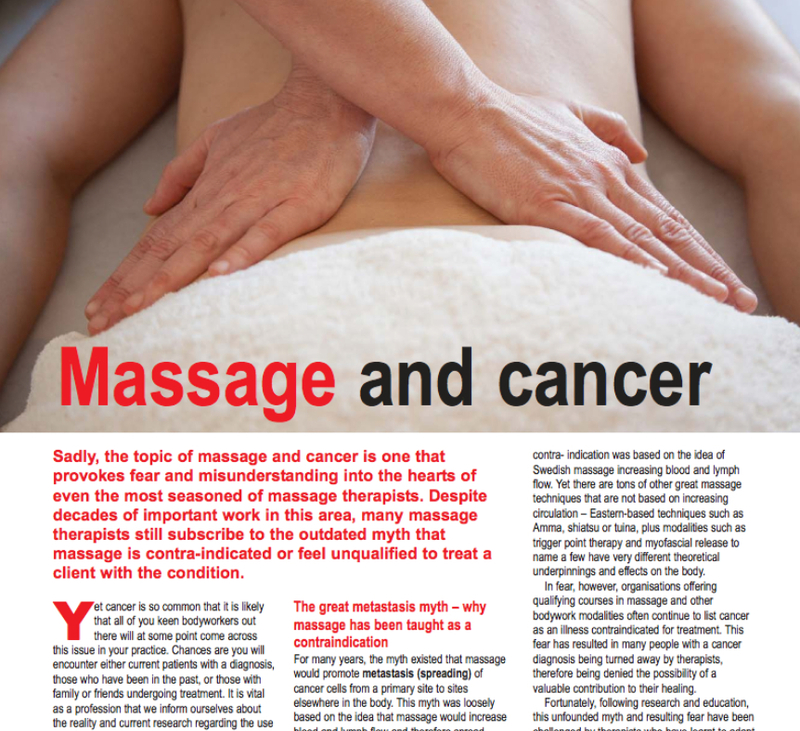 There is currently no scientific evidence to suggest that massage can treat (ie: improve or cure) cancer and indeed the CNHC has recently highlighted the Cancer Act of 1939 which states under Section 4 that it is a criminal act to advertise services which claim to ‘treat any person for cancer’ (treat in this sense meaning that you are suggesting your work can cure the condition) Saying for example that you work with people with cancer or quoting on your website the available research around benefits of massage and cancer would all be acceptable – suggesting that you can cure the condition would be unethical and exploitative. Small scale trials are continuously being published which support the benefits of massage in reducing some of the symptoms experienced by patients with cancer. All suggest the need to improve the quality and size of future trials. •	In 2005 Tiffany Field et al at the Touch Research Institute, Miami, reviewed studies, including ones with breast cancer and HIV patients, which showed a significant decrease in cortisol levels, and an increase in serotonin and dopamine levels following massage therapy. These changes indicate alleviation of stress and an increase in well-being. •	On their website, the largest private cancer centre, Memorial Sloan-Kettering, New York, states that ‘clinical studies show that massage can alleviate symptoms such as stress/anxiety, nausea, insomnia, pain, fatigue, and depression in cancer patients’. One of their studies in 2004 involved 1,290 patients over a 3 year period. Patients received 20 minute (inpatients) and 60 minute (outpatients) treatments. Symptom scores were reduced by approximately 50%, with benefits lasting longer (up to 48 hours) in outpatients compared to inpatients. •	A pilot randomized controlled trial published in January 2013 by Harvard Medical Center for Primary Care into massage therapy provided at home to patients with metastatic cancer concluded that ‘providing therapeutic massage improves the quality of life at the end of life for patients and may be associated with further beneficial effects, such as improvement in pain and sleep quality’. •	Dr. Peter Mackereth, Dr. Jacqui Stringer and Ann Carter, leads in Complementary Therapies at the Christie Hospital, Manchester, continue to carry out valuable research within their areas of expertise and all contributed to the publication ‘Massage & Bodywork – adapting therapies for Cancer Care’. “The patient’s body must be touched with hands of peace, whispered to, reverently anointed, or handled as if it is a delicate flower”. Once you have got over your fear of massaging clients with cancer the next step is as always- what do I do? There are many great books and courses on the topic that we would definitely recommend – in general any of the techniques you already know can be appropriate but you may need to make modifications. As always each client is unique so each individual should be addressed on a case by case basis – one client might be fine with some gentle neck and shoulder trigger point work, the next will find it a total overload for the system. The last two are fairly common sense. It is judgement about the first which requires greater consideration: how to adapt your treatment plan so it is less demanding on a person who has been or is currently experiencing trauma as a result of their illness or treatment. Where blood counts, immune function, lymphatic drainage, digestion and organ vitality are all affected, our aim should be to support these systems by helping to engage the parasympathetic nervous system rather than over stimulating with vigorous, deep work. As always, intent is more important than technique – as the song goes, one of my massage mantras is “it ain’t what you do, it’s the way that you do it”. With someone who is very ill and overloaded with drugs or radiotherapy, our simplest rule of thumb is to go back to what we know best- the simple power of connection. “Softness triumphs over hardness, gentleness over strength”. Touch does not have to be complicated. Remember our motto, Less is More! Effleurage can be a very meaningful technique which can release muscle tension and induce deep relaxation. Use it for all areas of the body – large areas such as the back, limbs and abdomen, and small areas such as the hands, feet and neck. Experiment with varying your pressure and speed. Remember that your client’s body is in a more compromised state. Use slow, light pressure to start and really notice how the tissue responds asking your client to confirm how it feels to them. Be creative and develop your own style! Off-body touch – hone into your ability to sense without touch. Use your hands like a scanner and slowly move over the whole body. Fine tune your intuition, it’s often right even if you are sceptical! Notice sensations of heat, cold, vibration, tension, movement, energy flow. Focus on the breath – encouraging our client to focus on their breathing not only brings quietness and release but also engages the core lymphatics. Sandwich your client between your 2 hands around the area of the diaphragm. Suggest the client breathes into your hands. Have a sense of the energetic connection between your two hands. Holding touch – hold an area 3D between your two hands and just allow the focused energy to permeate all the cells between. Your intention is to support the body’s natural healing system. In a situation where you cannot work elsewhere on the body then simply holding a persons hands or feet is giving them a nurturing touch. While it is important to dispel fear about offering massage for people diagnosed with cancer, it is also necessary to give serious consideration to their particular needs, and the complications which may arise as a result of the illness and its treatments. If you are working in a hospital, hospice or cancer support centre, there will be information available regarding prospective massage clients. In private practice, it will be up to you to be as informed as possible through training, reading, and contact with the client’s medical team – when appropriate and with the client’s consent. This article was edited from the Jing manual on Oncology massage, co-authored by Jing teachers Yvonne Cervetti and Sally Jefferies, and edited by Rachel Fairweather, Jing director. Yvonne and Sally both specialise in massage and reflexology for patients with Cancer and other life-limiting illnesses and have extensive experience working in supportive and palliative care. Rachel Fairweather is co-founder and director of the Jing Institute of Advanced Massage. Based In Brighton, London and Edinburgh Jing run a variety of courses in advanced techniques to help you build the career you desire, including a one day course on massage for cancer. Out short CPD courses include excellent hands on learning in all the different fascial approaches. For the therapist who wants to be the best they can possibly be, we offer a BTEC level 6 (degree level) in advanced clinical and sports massage – the highest level of massage training in the UK. Please call or check our website for further information and course dates.